Even though I love making things from scratch, even I have my days where I don't want to mess with measuring, leveling, etc. That's why I turn to box mixes, particularly boxed cake mix, more often than I would like to admit. I rarely ever follow the exact recipe on the back of the box. Over the years, I have tinkered with that recipe so that I can have the best version of boxed cake mix that I can possibly have. It doesn't require any more work, just a few different ingredients. Trust me, these ingredients make a world of difference. Instead of having a semi-dry, crumbly cake that you typically get from a boxed mix. The cake is super moist and has a lot more flavor. Sure it still has that distinct boxed cake mix taste, but there is something so nostalgic about it that I don't really care. The first tip to making a boxed cake mix taste homemade is to swap out the oil and water. Tip #1: Use whole milk and melted butter in place of water and oil for a richer and moister cake. Tip #2: Sift the cake mix before mixing in the wet ingredients. Have you ever noticed how lumpy cake mix is? Then you mix everything together and you still have dry clumps of the dry mix? That stuff doesn't bake away, they are left in the cake so that you have these little pockets of powdery cake mix. Sifting the cake mix beforehand will quickly get rid of those lumps so that you have a nice smooth batter. Once you add the wet ingredients into the dry ingredients, there is one last tip to making sure you have a delicious cake. Tip #3: Add in extra flavoring (i.e. vanilla, almond, lemon, etc.). Using a high-quality extract or a natural juice/zest will help the cake taste more homemade. 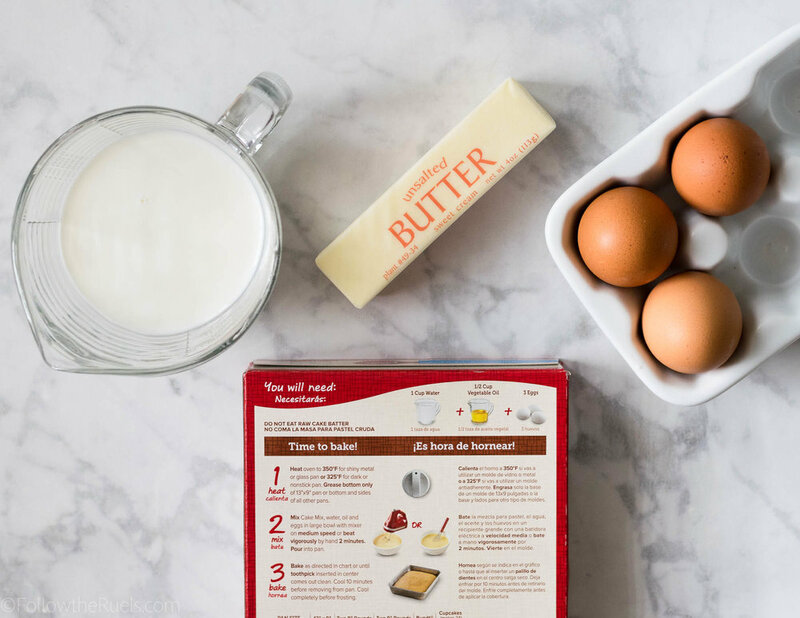 Once you have everything mixed together into a batter, you can make this mix into anything from cupcakes, to a cake, to cake balls. In this instance, I baked this batter into a two-layer cake. 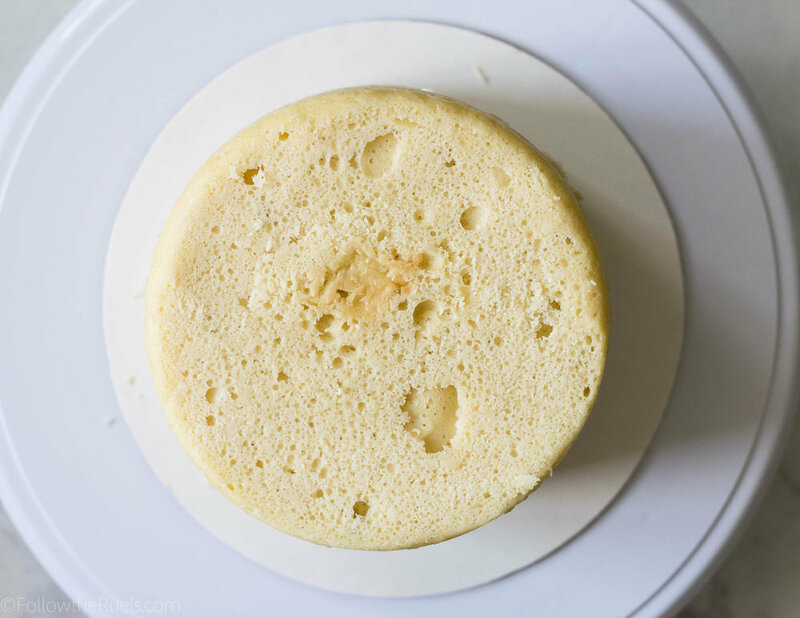 Whenever I bake a cake in cake pans I always line the bottom of the pan in a sheet of parchment so that the cake releases from the pan with very little hassle. All that is left is to ice the cake. Now my last tip to making a boxed cake mix taste homemade is to avoid using the store-bought frosting. Tip#4: Frost the cake with homemade frosting. You don't have to make a fancy Swiss meringue buttercream. Even a basic American buttercream or cream cheese frosting will work. But please avoid using that store-bought stuff, which has a distinct flavor that makes that whole cake taste like it's not homemade. And that's all you need to know to make a boxed cake mix taste like a homemade cake! So for those who hate baking from scratch, you can still make a fabulous cake without all the extra work! Preheat oven to 350 degrees and prep cake pans or cupcake tins. Sift the dry cake mix into a large bowl. In a separate bowl or measuring cup, mix together the wet ingredients. Pour the wet ingredients into the dry and mix to combine. Pour the batter into the prepared pans or tins and bake according to the box instructions.